Scroll down to purchase Spiritual Gifts either in hard copy or as an E-book on or before 12/31/2017. After you have read the book and completed the Motivational Spiritual Gifts Survey found in Section 3, email a copy of the completed Survey Scoring Sheet and Proof of Purchase documentation to Victoria@grandmotherslegacy.com. · An order confirmation page listing the sales date, items purchased, and purchase amount. · A packing slip listing the sales date, items purchased, and purchase amount. Proof of Purchase must be dated on or before 12/31/2017. Completed Survey Scoring Sheet and Proof of Purchase must be submitted no later than 6/30/2017. Upon receipt, I will analyze your Survey Scoring Sheet and advise you of the time frame when you can expect to receive your free analysis via email. 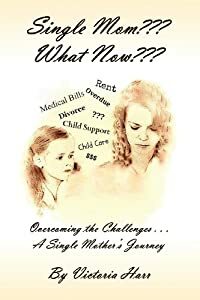 My third book: Single Mom??? What Now??? is now available in paperback and as a Kindle E-book on Amazon.com. It is also available for all other E-book devices through SMASHWORDS below. For a signed paperback copy of any of these books, please contact Victoria through the CONTACT US box on the right. Listen to this 20-minute interview of Vicki Harr by Kurt Steele about how her book "Spiritual Gifts, A Grandmother's Legacy to Her Grandchild" evolved and how it has launched a new dimension to her ministry, including a description of her second book, "A Grandmother's Life, as Told to Her Grandchild." San Diego Author publishes third book called ‘Single Mom??? What Now?? ?’ by Rev. Bill Copeland, ASSIST News Service. 'Grandmother writes book about spiritual gifts to her grandchild' by Rev. Bill Copeland, ASSIST News Service. 'A Book Review' by Paul McShane, author, businessman and journalist, Good News, Etc. "Vicki Harr writes about spiritual gifts with a warmth that puts us at ease while grounding us in the truths of Scripture. Sharing practical insights and tidbits from her own well-traveled spiritual journey, she carefully defines each gift, then shows us how it operates most effectively. I found the book immensely helpful and enjoyable and recommend it to anyone who wants to know more about this exciting aspect of Christian faith." "As I read this book I was impressed with the practical, well-balanced approach to an often misunderstood subject. Victoria Harr's gifted spiritual insights and practical application will demystify the workings of the Holy Spirit as she shares from God's Word and her personal journey. Whether you are a new believer seeking a better understanding, or a seasoned saint teaching the Word this book will help you begin a personal relationship with the Holy Spirit." "Do not quench the Spirit. II Thess. 5:19"
"I've been a pastor for 30 years... and I've known Victoria personally for over 25 of those years. I know her to be a very godly, focused, and mature woman. Her style will be easy to follow, and she'll be very practical in her handling of this important subject. Writing this as a legacy to her grandchildren equates to even more care than the average author." "Victoria, I just finished reading your book on Spiritual Gifts. I think that you did a great job. It is easy reading, personally related, and a very thorough and positive book for Christians (and anyone) to read and desire." "I have known Vicki since the early 1970’s when we served the Lord together in Shiloh Youth Revival Centers. Vicki was and is a caring nurturer in the church of God. The single parent experience of those days most certainly has made her a subject matter expert. The fruit of her labor, her grown children, and friends testify to the same. As I read her prose, I see continuing demonstration of this truth." Keith Kramis, Elder, Harvest Fellowship Community Church, Ordained Pastor and Minister, Shiloh Youth Revival Centers, Inc.
"If you are (or know) a single parent, we heartily encourage you to read Vicki's new book! As Shiloh alums with Vicki from the 1970's, we read with joy her insights and stories. As one of many bona-fide single moms from those early ministry days (now happily married 35+ years), I remember many discussions, Scriptures, tears, and prayers we all shared across Shiloh office space, in living rooms, backyards, kitchens, children's bedrooms...wherever we would find ourselves melting down or standing in faith. The Lord was compassionately working His Word into our lives and families, and Vicki has skillfully and wisely brought her insights and lessons together in these pages."